In the same walk that netted me these deer photos I also apparently wandered into the breeding territory of a male Red-winged Blackbird. Unfortunately for the bird and its offspring it had chosen rather marginal turf to try to breed in, in little tiny patches of cattails along a path. Needless to say, he was not happy with my intrusion. I was happy though, as I spent a couple minutes getting close-range flight shots of him as he circled me me while raising a ruckus. 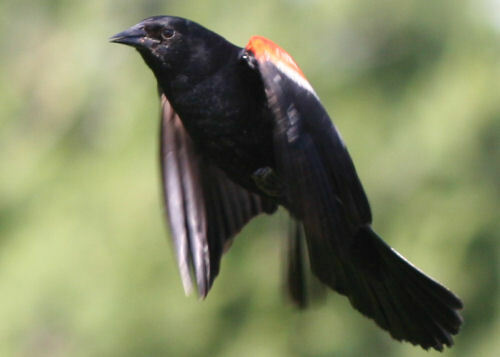 I’ve noticed that Red-winged Blackbirds don’t do their “honk-a-rhee” territorial song when trying to drive away an intruder that they perceive as a potential predator. Instead they make a bunch of clucking sounds and often belt out a three-part, high-pitched whistle. Hmm, everything I wrote didn’t show up!! Anyways, here it is again! LOL, I have had that happen to me a few times before! 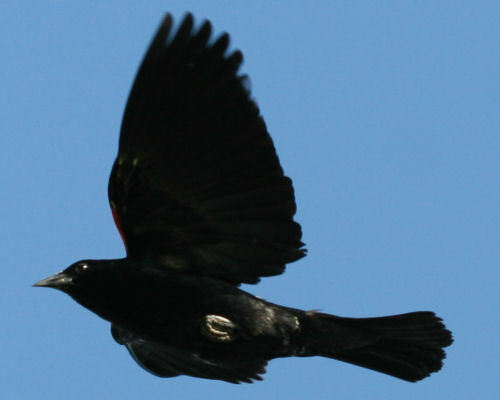 But, those Red-winged Blackbirds have never let me get any flight photos like this before! Bravo shots! Not a fan of the bird, seems he’s afan of my yard. He actually hit me twice, once in the back of the head, then circled around and hit me in the back. Nest was about 75 feet away. We lost the use of our pool last year as we were not able to go in the yard, and he returned this year. I really don’t want to hurt him, but even cleaning the pool is becoming an impossible task. We removed one nest at the beginning of spring, but I think the same bird has at least 2 more in our yard. I understand that he is protecting what is his, but my grandson would like to play in the pool, not watch it from the bedromm window. Any suggestions besides waving the white flag???? @Annette: Removing a Red-winged Blackbird nest is actually illegal so I would not recommend doing that again. I would say that standing your ground would be the thing to do. Eventually the bird has to tire out and/or get used to your presence. I think the bird must have had a closer nest because I think at 75 feet it would not have an issue with people. Ironically, when you removed the one nest you inadvertently made it more likely that the bird will attack you/make a ruckus when you are around because it now definitely sees you as a threat. Good luck! may have been last years, just didn’t was the hassles again this year. Do You Know Your Anglo-American Birds?